Newly built modern villas with sea views in the urbanization Raco de Galeno de Benissa on the Costa Blanca of Alicante, Raco de Galeno is an exclusive luxury urbanization with modern and avant-garde villas, ideally located between Moraira and Calpe, just a few minutes by car from the most famous beaches of the Costa Blanca. This urbanization is the newest in Benissa so it has a perfect infrastructure, which includes internet, all underground cables, sewer, parking spaces, green areas, sidewalks, central gas, street lighting, mouths for surface moisturizers , with South orientation. It is the only urbanization with luxury villas of modern designs, you can enjoy an exclusive neighborhood with only first class villas. You can enjoy from sea views to the mountains and the town of Calpe of 180º. 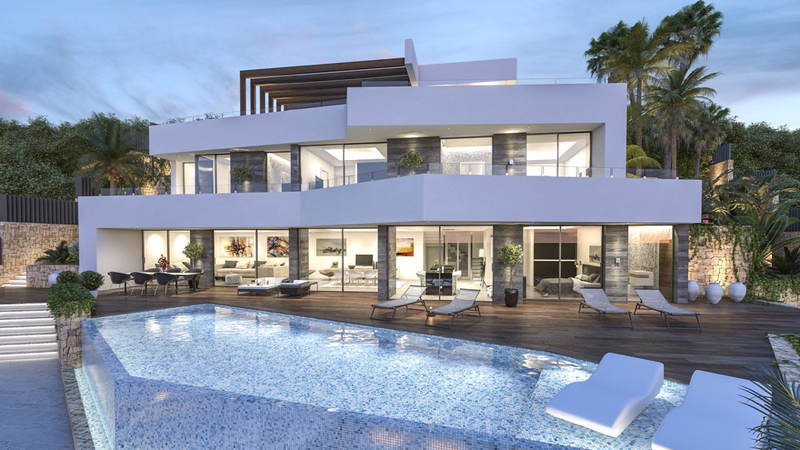 Pinoazul residential Jávea on the Costa Blanca of Alicante is an exclusive development of 4 villas of contemporary modern design with stunning sea views. It is the place you have always dreamed of with 320 sunny days, four minutes by car from the Arenal beach of Jávea and 100 km from the two main international airports of Alicante and Valencia. We have the widest offer of new construction villas with contemporary, minimalist and modern architecture by the sea, with sea views, on the beach and close to international schools, yacht clubs and golf courses and we stand out for the personal treatment, transparency and absolute confidentiality with our customers. Denia Beach residential complex with 79 apartments and penthouses of 1, 2 and 3 bedrooms with large terraces with incredible views of the Mediterranean Sea, large green areas surrounding the communal pool area, lined by stone and wood outdoor walks with pergolas, fully fenced for security and privacy. Large terraces, looking to maximize the light of the Mediterranean and the best views of the sea, merging with the environment and respecting the nature that surrounds it, area of ​​footbaths and temporary storage of beach equipment. The complex is located just 60 ms away from the beach of les Deveses and Almadraba in Dénia, close to all services and on one of the best sandy beaches in Dénia on the Costa Blanca of Alicante. Villa Llorer, Modern luxury villa for sale with sea views in the Montgó Dénia on the Costa Blanca North of Alicante distributed over two floors on a plot of 692 m2 with 3 bedrooms, 4 bathrooms, modern fully equipped kitchen, living room with direct access to the terrace with infinity pool and the garden. The next days 15, 16, 17, 18 and 19 March a total of eleven Fallas commissions plant the Fallas in Dénia. The important days of Las Fallas begin with the “plantà” or planted fallas, which is March 15 and from that day these parties are very intense until the night of San José, on March 19 where the “Cremà” announces the end of the party. The parties are lived every day in the street with “parades”, “mascletaes” (rockets), music, popular dinners and dinners, fireworks and lots of fun. • The “Plantà”: Placement of the Fallas monuments in the different Districts. • The “Mascletà”: A large number of rockets are fired in each Fallero District at approximately 2:30 p.m., filling the city with noise and gunpowder. • The “Parades”: The falleros walk the streets dancing with the accompaniment of the band of their fault. • The Floral Offering to the Virgin of the Desamparados: One of the main acts, where the falleros dress with their best costumes and go in procession to the Virgin with bouquets of flowers, which they deposit in their mantle. • The “cremà”: The faults are burned, concluding the Fiesta. First the infantile faults are burned, to give way to the faults of greater volume. In Dénia not all flaws burn at once, they burn progressively. This allows tourists and residents to enjoy the cremà of different Fallas. Spain becomes the healthiest country in the world. Maybe it’s something in gazpacho or paella, as Spain has just overtaken Italy to become the healthiest country in the world. Spain is the healthiest country in the world, with a score of 92.7 out of 100, after advancing six positions since the 2017 analysis, according to the Bloomberg Healthiest Country Index study, which highlights the quality of the public health system. According to data from the United Nations, Spain shows the highest life expectancy at birth among the nations of the European Union. According to the forecasts of the Institute of Metrics and Health Evaluation of the University of Washington, it is forecast that Spain by 2040 will have the highest lifetime, with almost 86 years, followed by Japan, Singapore and Switzerland. “Primary care is essentially provided by public providers, specialized family doctors and nurses, who provide preventive services to children, women and the elderly, and acute and chronic care,” according to the European Observatory of Health Systems and Policies 2018, a review of Spain. , observing a decrease in the last decade in cardiovascular diseases and cancer deaths. Researchers say that eating habits can provide clues about the health levels enjoyed by Spain and Italy, since a “Mediterranean diet, supplemented with extra virgin olive oil or nuts, had a lower rate of cardiovascular events greater than those assigned to a low-fat diet. ” According to a study conducted by the Faculty of Medicine of the University of Navarra. Building plots and modern new construction villas with sea views in the urbanization of Camarrocha de Moraira on the Costa Blanca in Alicante, Camarrocha is an exclusive urbanization with modern and avant-garde villas, ideally located just 5 – 10 minutes by car from the beaches of Moraira, near Jávea and the town of Benitachell. This urbanization is the newest in Moraira with South orientation, so it enjoys a perfect infrastructure, which includes internet, all underground cables, sewer, parking spaces, green areas, sidewalks, central gas, street lighting, manholes for surface moisturizers. It is the only urbanization with modern designs, you can enjoy an exclusive neighborhood with only first class villas. You can enjoy from 180º views of the sea to the mountains and the town of Moraira. We have for sale the best building plots for construction, free of construction, no obligation of construction with any builder and the modern and minimalist villas that are currently under construction in the urbanization of Camarrocha in Moraira. Bloomberg. By Lee J Miller and Wei LuThe annual ranking compiled by Bloomberg covers 56 national health services in total. Once again, the Spanish health system is the best in Europe, it is official. The state medical services in Spain are the third most efficient in the world, surpassed only by those of Hong Kong and Singapore, respectively. Germany with 45, Denmark with 41, Belgium with 38, United Kingdom with 35, Austria with 32, Czech Republic with 30, Holland with 28, Poland with 24 and even Sweden with 22, and the vast majority of the 56 countries in the list having seen a fall in their classification compared to last year, it may seem that Spain does not have much competition. Finland, Portugal and France do not manage to be among the top 15, Greece, Ireland, Switzerland and Norway do not reach the top 10. The contest, organized by the Association of Hospitality and Tourism of the Marina Alta (Aehtma) and in which the City of Dénia collaborates, has gained a place among the most innovative gastronomic competitions. organized by the Hotel and Tourism Business Association of the Marina Alta (Aehtma), in collaboration with the City of Dénia. 2019. Real Estate Services Costa Blanca North - Alicante - Spain. All rights reserved.